The North American Marine Environment Protection Association (NAMEPA) is a maritime industry-led initiative which operates as a voluntary, non-profit and nongovernmental organization committed to preserving the marine environment through educating seafarers, port communities and students about the need, and strategies, for protecting this important global resource and engages maritime businesses, government and the public to “Save our Seas” by promoting sound environmental practices. For more information, visit namepa.net. It is headquartered in Southport, CT. In 2007, when NAMEPA was founded, “environmental risk” was just gaining prominence. The regulatory “green squeeze” that now governs much boating operations was barely a cloud on the horizon. True, a few environmental groups such as Soundwaters had launched some robust programs, but there was some feeling – which gave rise to NAMEPA – that more needed to be done to engage with environmental players. Five years ago, the Deepwater Horizon incident was in the future, and we were just becoming conscious of the growing significance of the Arctic. NAMEPA was conceived as a maritime industry-led initiative, committed to educating seafarers, port communities, students and the public at large about cleaner seas. NAMEPA is a coalition; it does not advocate a specific commercial or political position. Rather, it serves as a catalyst or facilitator, responding to the need for a voice that communicates with environmentalists, regulators, the public and opinion leaders. NAMEPA has created strategic alliances to leverage its strengths with the abilities of like-minded groups. 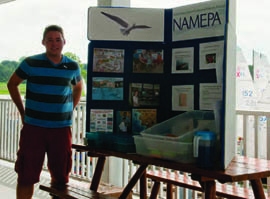 NAMEPA, under its Memorandum of Agreement with the U.S. Coast Guard, has this year produced and delivered 120,000 marine debris brochures and posters, for distribution by the Coast Guard Auxiliary to the general public. From a grant directed by the National Fish and Wildlife Foundation, NAMEPA created, produced and distributed a MARPOL/Marine Science booklet and DVD targeted at seafarers and boaters. This project was possible through a collaboration with Sea Research Foundation’s Jason Project and the North American Maritime Ministry Association. Another successful alliance was forged with the American Salvage Association in fostering NOAA funding for the “Wreck Oil Removal Program.” As a result of that initiative, and work done with marine debris education, NAMEPA is about to sign a Memorandum of Agreement with NOAA as well. This year, NAMEPA partnered with Transport Canada to produce the World Maritime Day Observance on the Titanic in Banff, Alberta. One of NAMEPA’s objectives is to promote an ability to predict the environmental problems at sea before they arise; to anticipate and help prevent the Deepwater Horizons of tomorrow. Our society needs to do more of this. Today NAMEPA, a descendant of HELMEPA (Hellenic Environment Protection Association) founded in Greece 30 years ago, has more than 100 members. NAMEPA’s projects and programs have, among other topics, covered marine environmental care, oil spill remediation and response; marine engineering, underwater robotics, air emissions from ships, alternative fuel supplies for ships, offshore well control, diving systems, marine biology, marine ecosystems, marine microorganisms, ship design, ship breaking, and recovery of sunken ships. In the far north, NAMEPA is at work in Alaska supporting the establishment of an “institute of the oceans,” which it is hoped will include a major degree of participation by private industry, the native peoples of Alaska, and of course the academic community. NAMEPA has also initiated a Science and Technology competition among schools, academies and colleges, open to cadets and graduate students with entries received from around the country. NAMEPA also collaborates with the United States Coast Guard and Sea Research Foundation (Mystic Aquarium) on an annual Children’s Drawing Contest surrounding marine issues. The winners from both programs win small grants from NAMEPA. In the next year, the U.S. Coast Guard Auxiliary will be deploying Marine Debris curriculum developed by NOAA for grades K-12. NAMEPA is managing and funding the project. This past summer, NAMEPA engaged Jamie Fales (pictured) from the University of Connecticut as a summer intern. Jamie represented NAMEPA in Newport, RI at the America’s Cup World Series, and manned a booth in the Environment Education tent. Jamie also traveled to Long Island Sound sailing regattas as an educational outreach coordinator with information and games on marine debris. He distributed reusable water bottles and marine debris posters to junior sailors.